When user writes long document such as book, it is easier if they can change whole headings' fonts by few clicks only. Actually, some important parts in LibreOffice Writer document such as default font, heading, list, caption, and index have their own setting. So it is possible to change just one or whole types. 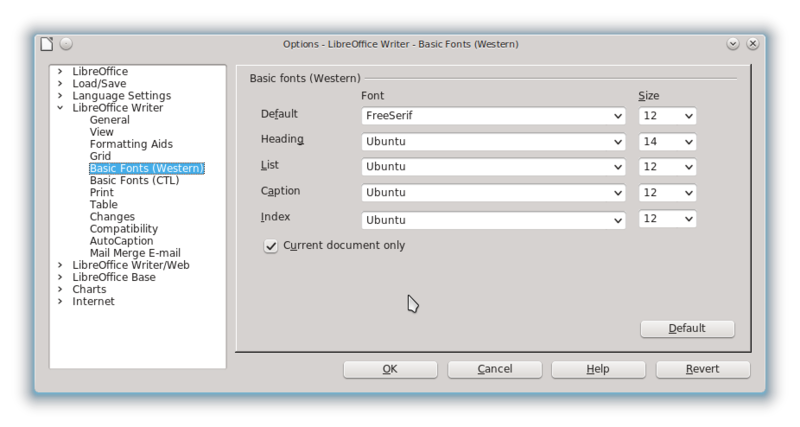 To change default font in Writer, open menu Tools > Options > LibreOffice Writer > Basic Fonts (Western) > choose what type font you need to change. See picture below. For example, if you want to change all headings on document to be FreeSerif 12pt, so choose on Heading field "FreeSerif" and insert "12" value in Size field. Note: if you want these changes apply into every new document later, don't check Current document only option. If you check it, then the changes only apply on current document.